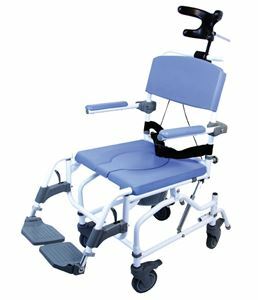 Commode Chair: 18" / 46 cm Tilt Commode Chair,Aluminum Attendant Shower and Commode Chair with 18" tilt seat. Aluminum Attendant Shower and Commode Chair with 18" tilt seat. Aluminum Attendant Shower and Commode Chair has an 18" tilt Seat.